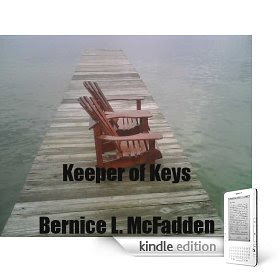 In recognition of National Women & Girls HIV/AIDS Awareness Day, I'm pleased to announce that author Bernice McFadden will join us on Wednesday, March 10, for an online discussion of her e-book, Keeper of the Keys. This moving short story of a young woman who considers suicide when she learns she has AIDS is only available through Amazon.com and only in e-format for the low price of $ 1.99. If you don't own a Kindle, you can still join in by reading on your iPhone, on your Blackberry or on your computer, using Amazon's new Kindle for PC app. Both apps are free. Please don't miss out on this opportunity to discuss such an important topic in our community. Happy reading and we'll chat next Wednesday, March 10 at 8 pm EST/7 pm CST right here.